To see YAML in action, we first look at how to create a routing YAML file in Symfony to replace the code-based routes we used in our previous examples. So, first things first. In order to use YAML in Symfony - now, in this example we're using it in our project instead of in Drupal 8 directly - we need to include the YAML component, and that's going to be something that we pull in through our composer. json file. So, let's jump to our resource pack directory. So, let's compare the step 2 composer. json adding YAML component . step to our composer. json file in our Symfony 2 folder. I'm going to drag this over to my file comparison tool, and then I'll drag the other file over too. And so, on our left we have our original file, and on our right we have the updated file and you can see that we've added two lines - one for the YAML component and then the other for the config component. Now, Drupal 8 doesn't use the config component. It basically recreated certain parts of the config component to make it more performant. 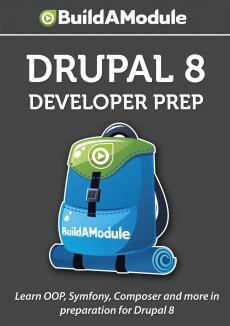 So, we don't need that in Drupal 8. You're not going to see it in the composer. json file in a Drupal 8 base directory, but in order to use YAML in this context where we don't have Drupal 8 as well, we're going to need the config component too. The other change that you might have noticed here is that we're going from version 2. 1 of these various components over to version 2. 4. The reason why we're doing this is because in Drupal 8 it uses the 2. 4 component. Now, if you remember from our discussion about semantic versioning earlier, the point four is a minor release so it means that there should be backwards compatibility. So, all of the examples that we've done so far should work just fine in 2. 4; however, there are some things that you can build in 2. 4 or some features that you can use in it that won't be available in 2. All right. So, let's open these up in our editor, and I'm going to copy the code from our composer. json adding YAML component . step over the code that's in the current composer. json file and save it. And now we'll need to run composer update. So, I'll jump back to the command line, and we should be in the right folder. And I'm going to type in composer. phar update. All right. It looks like everything is good to go. So, now before we start applying YAML to the various parts of our application where it would be useful, let's look at what we have now. I'm going to jump back to our folder, and let's expand out our source folder so we can see everything that's in there. This should look familiar from the previous videos. Now, the point of YAML is to replace areas where we're establishing configuration using an array of some kind. So, there are two places in our code where it would make sense to switch over to this format. The first is with our routes which we can find in our app. php file. So, let me open this up. Now, we only have one route in our routes at this point, but as we increase complexity in our application, we would end up seeing this routes add many times.